After a couple of decades Kamal Haasan has acted in a Malayalam film. This film, Four Friends, was released yesterday all over Kerala and in six theatres in Chennai. 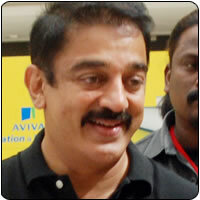 Kamal appears as actor Kamal Haasan in Four Friends, which also has Jayaram, Kunchako Boban and Jayasurya. Meera Jasmine is the leading lady. The Ulaga Nayagan had said that he signed up this film as his close buddy Jayaram requested him to. Shaji Surendran, the director who has two hits to his credit already, has directed Four Friends and Mulakupadam Films’ Thomichan Mulakupadam has produced it. Popular Malayalam music director M Jayachandran has scored the music for Four Friends.